NHK and five commercial TV broadcasters held a splashy launch party in Tokyo’s central Shinjuku train station on Saturday afternoon, announcing the official start of terrestrial ‘One-Seg’ broadcast services. The carriers have lined up accordingly: NTT DoCoMo has partnered with Nippon Television and Fuji Television, while KDDI has forged a partnership with TV Asahi. 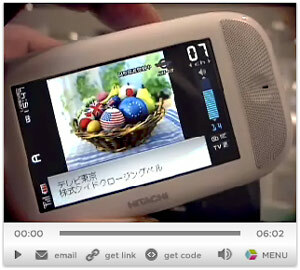 The new digital tuner-enabled handsets, coming from Panasonic, Hitachi and Sanyo, should deliver up to three hours of TV viewing time by processing and decoding only the requested channel — as opposed to current analog units which run only about an hour and eat more juice as they decode all incoming broadcast channels. Vodafone’s 905SH from Sharp is rumoured to be available just in time for the World Cup in June. WWJ has been covering this story since the spring of 2004 when early prototype handsets were first introduced at an NHK open-house event. Initially, content will be available in real time for free and consist of exactly the same programming that is already served to existing home digital TV sets; nonetheless, broadcasters and mobile content providers are anxious to explore mobile digital TV revenue possibilities. Both TV broadcasters and advertisers can use live feeds and hot link campaign web sites right on the TV display on the phone to drive program interest, audience participation and — of course — impulse buying. Political and corporate Japan, two legs in this country’s famous “iron triangle,” have often moved hand-in-hand towards common goals and the digital terrestrial broadcasting initiative is no different. Development of digital TV handsets by the telecos in conjunction with the broadcasters and handset makers has given the whole project de facto government backing. But direct government involvement has tended towards the public service, safety and security aspects. 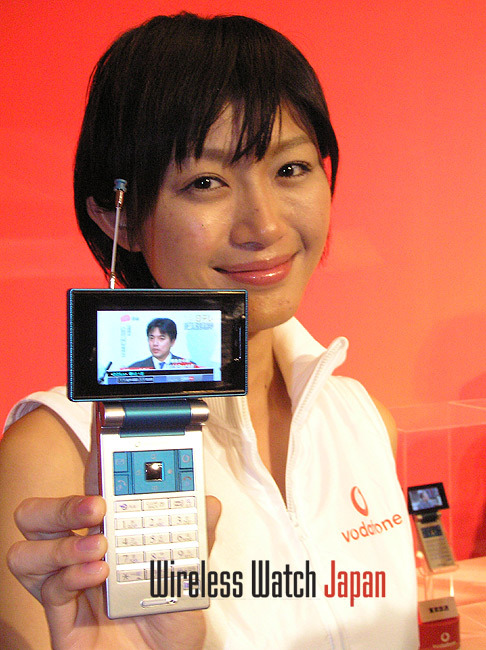 WWJ’s report of June 2004 touched on NHK’s determination to bring the Emergency Warning System onto mobile handsets. At that time, deployment of EWS onto mobiles proved too draining to cell-phone batteries. At the chip level, engineers had been using FFT (Fast Fourier Transform) processing, commonly used for digital terrestrial broadcasting reception. But by slotting the signal into a different band, engineers found they could leave the circuit on standby, waiting for activation without eating into battery power. Should an emergency occur, the EWS network will ping mobile phones in stand-by mode, cueing users to turn on the phone and tune in to live NHK emergency broadcasts. Since the digi TV signal broadcast can contain other data as well, it is also possible to obtain emergency information issued during natural and other disasters. This fundamental data-in-a-signal functionality is also what allows such a huge range of potential commercial uses. A typical example would be the linking of TV programs that announce information regarding events or entertainment (such as movies) with GPS data, such that a mobile user can obtain the nearest theater’s location, for example. Full-service broadcasting of “One-Seg” programs which can provide terrestrial digital television broadcasting to cellular phones, car navigation systems, TVs, etc., started in 29 prefectures, such as Tokyo and Osaka, on April 1st. Although the number of sales is not released, the One-Seg manager at NHK says “about 500,000 receiving units have been sold.” For price at a major electronics store in Shinjuku, the newest model is around 40,000 yen. We’ve gathered a rather full set of links – below – to other sources of info on this project. http://en.wikipedia.org/wiki/1seg Terrestrial digital broadcast in Japan (ISDB-T) is designed so that each channel is divided into 13 segments. HDTV content occupies 12 segments, and the remaining channel is used for mobile receivers. Thus the retail name 9for mobile TV): ’1seg’ or One-Seg. 1seg broadcasting uses H.264 video and AAC audio encapsulated in an MPEG2 transport stream. Maximum video resolution is 320×240 pixels, and the maximum video bitrate is 128 kbps. One-Seg audio conforms to the AAC-LC profile, with a max bitrate of 64 kbps. Additional data using BML (Broadcast Markup Language), such as electronic program guides, interactive services, etc., occupy the remaining 60 kbps.